Good Toes, Naughty Toes: Whilst sitting, stretch your legs out in front and turn your feet up. Stretch through your feet right to the end of your toes (good toes). Remember to try not to bend your knees. Keep your body pulled up too. Children love this! Rising Star: Whilst holding onto a chair, rise up onto your toes then see if you can let go and twinkle your fingers like a star;-) This one’s great for improving balance. Summer Flower: Start curled up in a little ball then put your fingertips together and point your arms towards the ceiling. Unfold your body to follow your arms as you grow, and grow and grow. Stretch out your arms and do a ballerina turn as you unfold your petal arms in the sunshine. First Position: Whilst standing, place your heels together and turn out your toes. See how long you can hold the position whilst holding on to a chair or other piece of furniture. Fairy dance: If you have some fairy wings and a wand you could use them in your dance or you can just pretend. Show lovely little fairy steps and perhaps make some magic with your wand. Stretch your feet, right to the ends of your toes. Imagine you are wearing Twinklesteps’s shoes and they sparkle when you stretch your toes. Princess Walk: Feet in first position, hold your skirt or put your hands on your waist. Imagine you are a Princess with a beautiful tiara on your head. Remember to keep your body pulled up and look very proud too. Watch this video to see Joanna helping you through some steps and exercises. She also demonstrates the demi-plié (plié means to bend and demi means half) which isn’t as hard as it sounds! Twinklesteps from TudnoTV on Vimeo. 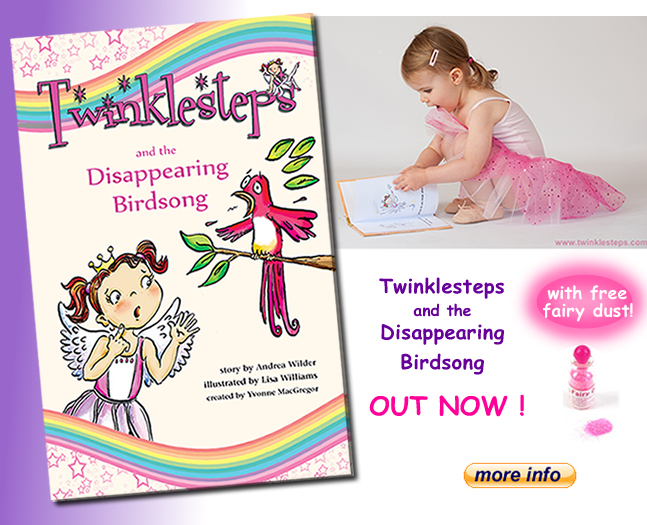 Check out our book ‘Twinklesteps and the Dsappearing Birdsong‘ for some ballet inspiration for your child. Happy Dancing from The Twinklesteps Team. This entry was posted in Ballet inspiration and tagged ballet, ballet moves, children, Dance, first position, imagination, magic, music on March 20, 2014 by twinklesteps.